Reporter Lizzie Phelan contacted a friend yesterday to say that she had been threatened by CNN personnel and had been blocked from using facebook and email. Below, you can see the warning given to the Libyan people by state media of Al Jazeera’s coming psyops. The presenter tells the viewers that Al Jazeera have produced a simulation of Tripoli’s Green Square, and that they are going to use this to produce a gigantic fiction of ‘liberated’ Libya. The picture above proves that the producers of the Al Jazeera hoax are no Dutch masters, as the glaring discrepancies between the real Green Square in Tripoli and the Al Jazeera version are patently obvious. 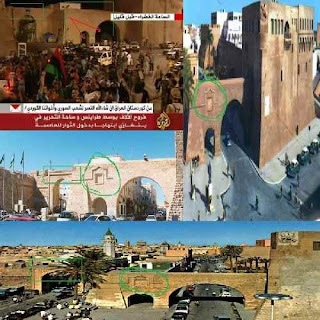 The differences between the architecture in Green Square in Tripoli and the pictures shown in Al Jazeera are well documented in the video below. While the Al Jazeera mise-en-scène is entertaining, the leading actress Zeina Khodr is unlikey to receive awards for her rather slugish performance. She said her lines rather mechanically, as one who was not particularly enamoured of the script, or perhaps it was the far-fetched aspect of the entire screen play that bothered her.